After the awesome discussion we had on our podcast yesterday abut how to save on meat, we put together this short video to break down some of the best money saving tips on meat. Enjoy! Meat is expensive. Unfortunately, no matter how much price matching you do, meat is always going to be one of the biggest portions of your grocery budget. Now that I’ve cut out all sugar and don’t eat many grains either, meat is probably where 50% of my total grocery spending goes. The tips I put together on how to save on produce help to reduce my spending there but I knew I needed some strategies for the meat counter. It took a while to do the research and a few very helpful interviews with the butcher at my local Walmart but these tips are awesome and they work like a charm. I hope you enjoy these tips on how to save money at the meat counter. Most butchers will gladly take any piece of meat and cut it any way you want. For instance, my butcher said that he has taken a whole chuck roast and cut it into stew cubes or turn a flank strip into stir-fry strips. You can get a big roast and remove the bone for soup, run half through a grinder for hamburger and cut the remaining portion into a pot roast. This will usually save you up to 30%. There is another benefit to this as well. Typically when we buy hamburger meat, it contains meat from many different cows. In the rare instance when one cow has an infection or disease, it can taint a lot of packages of hamburger meat. If you have a single piece of meat ground up, you know all that meat came from one animal, reducing any risk of disease. Most meat counters will discount their older meat at the same time everyday, usually in the morning. Ask your butcher when they do it and try to do your shopping around that time to get the best deals. The words on a package of meat can be a little confusing so it’s difficult to gauge how much bang for your buck you are getting on each piece of meat you want to buy. Just because it says Angus or anything else doesn’t necessarily mean that you are getting a tasty steak. What you need to look for are the USDA meat grades that will usually be on the packaging somewhere. USDA Prime is the best quality of beef and has been USDA certified to come from young, well-fed beef cattle with abundant marbling. The next step down is USDA Choice which is still high-quality but has less marbling. The last step is USDA select. It is usually the cheapest, has less marbling and isn’t as tender. Below that are Standard and Commercial grades of beef and are frequently sold as ungraded or as store brand meat. Utility, Cutter, and Canner grades of beef are seldom, if ever, sold at retail but are used instead to make ground beef and processed products. Another thing to look for are words like grass-fed or grass-finished. These cuts of meat will usually be more expensive but are supposed to far healthier to eat. I’m not an expert in this area but I’m learning and it is fascinating. So I think I saved the best tip for last, or at least it’s the tip I had never heard of and was a little blown away by. In fact, I may never buy a NY strip steak again and that was always my “go-to” cut. Every time you buy a T-Bone, there is a filet mignon on one side of the bone and NY Strip on the other. Cut those pieces off the bone, wrap the filet in bacon and enjoy 2 steaks for the price of one. My butcher recommended getting the thickest T-Bone you can find so the filet is nice and juicy and he showed me how that would save my $3-$5 a pound. Wow! 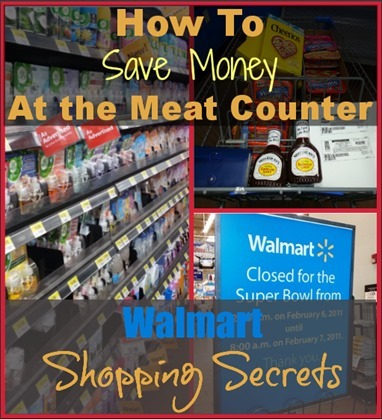 Check out my other Walmart Shopping Secrets here!